2. 1 pint boiling water. 3. 3 cups cold water. 4. 1 cup celery, minced. 6. 3 cans whole cranberry sauce. 1. Dissolve the orange gelatin in the boiling water. 2. Add the cold water, place in a pan and chill until gelatin is partly set. Remove from the refrigerator. 3. Grind the whole oranges on the food grinder, use the medium chopper plate. 4. 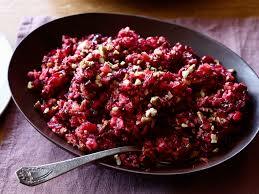 Blend together the ground oranges, celery, whole cranberry sauce, sugar and pecans. 5. Fold this mixture into the gelatin mixture. 6. Pour into individual molds, refrigerate until firm. 7. Unmold and serve on crisp salad greens.